A little lesson on the 2008 financial crisis, in front of the University of Chicago European campus. And here comes a chopper to chop off your head! The typical London corporate eatery trifecta: Eat, Starbucks, Pret. Bank underground station, named after the Bank of England. Administrative center of the City of London. The top of the Guildhall, featuring the coat of arms and some protective dragons, which feature prominently throughout the City. The City of London is a city located in the city of London. Confusing? Let me rephrase: the “City of London”, also known as the “Square Mile”, is an autonomous zone located in the center of what is generally known as the enormous, 8-million-person-strong metropolis of London. This tiny administrative area in fact pre-dates Greater London, as it marks the original spot of Roman settlement. What makes the City of London interesting is that it does not fall under the same governance as the rest of London. It does not answer to the Mayor of London Boris Johnson, but has its own “Lord Mayor,” who is chosen in a not-so-democratic process where businesses as well as individual people get to vote. The larger governing body is the City of London Corporation, which, again, predates all of the other London governance bodies, being so old that there is in fact no record of when exactly it was created. Why does it matter if this square mile of land plays by different rules than the rest of London? Well, the City is also London’s financial center, where most national and international financial industries and institutions and have historically been based. This means that the businesses based there are subject to their own, entirely separate, set of regulations, which may mean not much of any regulation at all. The City uses its wealth for political lobbying both within and outside the UK, advocating for—you guessed it—liberalization and deregulation. If the Square Mile sounds like a tax haven, it kind of is, as George Monbiot has argued in the Guardian. Incidentally Monbiot also labels the Square Mile “where democracy goes to die”. At various times throughout London’s history, there have been attempts to end the division between the City of London and the rest of Greater London. But these have been unsuccessful (Maggie Thatcher and Tony Blair being two of the more recent figures to come to the City’s defense, in the name of preserving business interests). 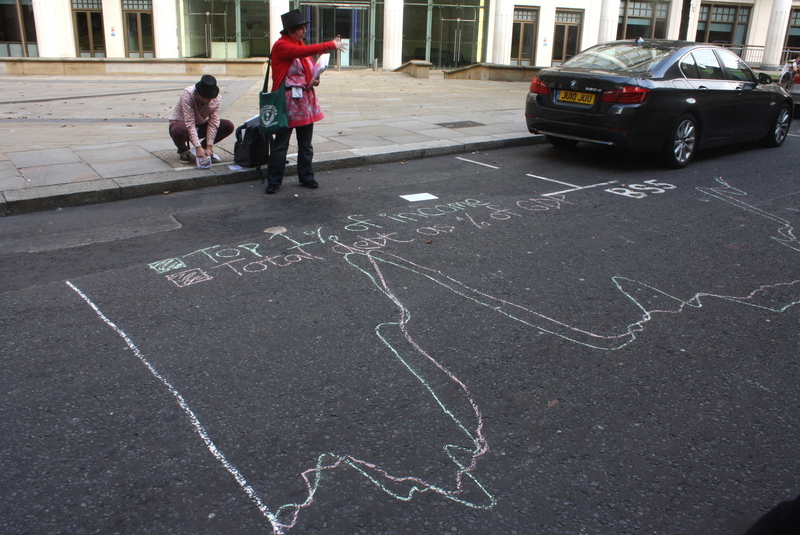 I learned much of this on an Occupy London Tour of the City (highly recommended! ), which explored the role of this absurd spatial demarcation in the 2008 financial crisis. On the tour we visited St. Mary-le-Bow church, thought to represent the “bells of Bow” in the nursery rhyme above. Though the rhyme is hundreds of years old, in the present day it seems to evoke quite well the grip of financial institutions on residents of Greater London. To the City’s eastern edge lies the London Borough of Tower Hamlets, one of the poorest regions in the entire UK. As the property market becomes increasingly deregulated and London becomes increasingly unaffordable to anyone but the very wealthy, it’s “business as usual” (literally) in the City of London. Even after the financial crisis, the near-ancient system of government and longstanding tradition of protecting business of above all else continues unabated. Opie and P. Opie, The Oxford Dictionary of Nursery Rhymes (Oxford University Press, 1951, 2nd edn., 1997), pp. 337-8.